With an extra 350mm platform height above our standard podium, the large podium steps have a working height of 3.6 meters. 1.6m platform height. 3.6m working height. Imagine the perfect solution for those low-level jobs which does not involve using a step ladder or a mobile scaffold tower. The podium steps Mk II could be exactly what you have been searching for. The Mk II is ideal for small jobs both indoors and out where using alternative equipment is simply not appropriate. Perhaps you just have one small job to do and assembling a mobile scaffold tower is not time-effective or you need to work alone for part of the time, impossible if you are using a ladder. Manufactured from aluminium, the Mk II is lightweight at just 29kg and can simply be folded flat so it is easy to manoeuvre on site, through single door frames and transport. The Mk II podium steps are made to the very highest specification which conforms with all the current HSE and building regulations. At this height is it best to start using a scaffold tower instead of a podium steps? It all really depends on the type of work you carrying out. Remember a podium is easier to get onto. 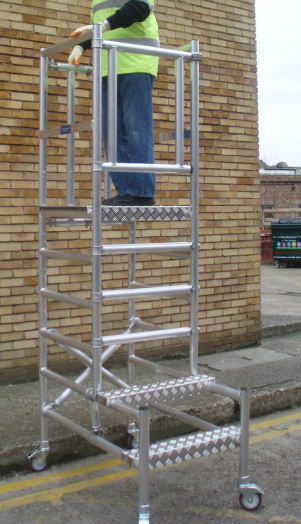 An aluminium scaffold tower gives a greater working area. If you would benefit from a large platform area then at this height it could pay to use a scaffold tower. For example if you need to install a suspended ceiling or fit duct work. If you’re doing spot work, changing light bulbs for example, a podium may be better. Also remember that a PASMA training certificate is often asked for on building sites when using scaffold tower hire. Podium steps require very minimal onsite ladder training. * FREE DELIVERY! Subject to minimum hire periods. Please contact us for more information.